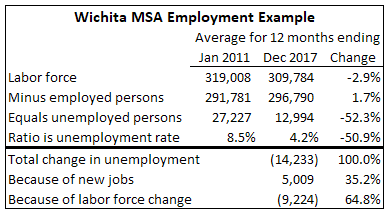 If Wichita-area companies can’t fill jobs, the declining labor force may be the reason. Who is responsible? It’s a useful article. But where it could be better, especially when discussing how Wichita companies will find workers to fill anticipated new jobs, is to note the shrinking Wichita labor force. I chose the year ending January 2011 as a comparison point, as it is near the low point of the great recession. Since then, the unemployment rate has fallen greatly, and is just half the rate of 2010. It is possible that the unemployment rate falls while the number of people employed falls or rises slowly. This is the general trend in Wichita for the past seven years or so. The nearby table illustrates this. The labor force has fallen, and by a lot, while employment growth has been modest. In fact, of the changes, we can say that 35.2 percent of the change in the unemployment rate is due to new jobs, while 67.8 percent of the change is due to a smaller labor force. Our leaders are quick and eager to take credit for economic development gains. But what about the shrinking labor force caused by the many of the same leaders and their policies? I can explain why the caliber of the workforce in Wichita has decreased in one word. Greed. The corporations in town such as Spirit, Textron, Bombardier have pilfered the once thriving companies in the name of globalism. They are constantly striving to decrease the production cost to build their aircraft to sell to, and compete with foreign countries. They have laid off or forced retirement on those that would have retired so that they don’t have to pay their wages and subsequently pay for their retirement nest egg. They have done away with pensions and stagnated the wages. This is why I have been a contractor for the last ten years. I worked at Cessna for 10 years. If you would have told me in 1992 when I started there that I wasn’t going to retire from Cessna I would have scoffed. My how the brutal reality of greed and globalism has consumed our society in such a short time. The Fabians are coming…..